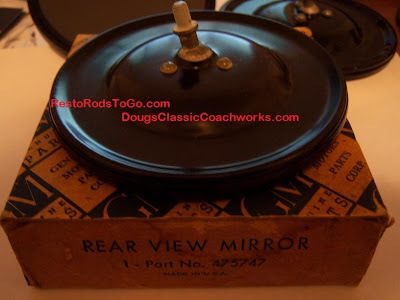 No Glare or Non Glare mirrors are very rare to see on a Vintage or Restored Car. Not many people even consider the importance of the Glare free mirrors and quite probably, don't even know they exist. I think I can safely say that no one is reproducing no glare mirrors for Classic Cars, however all cars used non glare mirrors as original equipment, for nearly as long as cars have been built. The reason being is that when you are driving at night and a car comes up behind you with headlights on, you will be blinded. I personally think that manufacturers should be required to install non glare mirror in any and all reproduction or replacement mirrors that are to be used for automobiles. Not that I am for more government control but this truly is a safety issue. 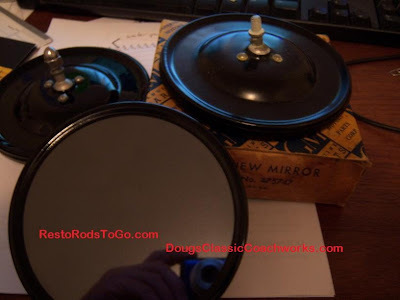 I make a special effort now to make sure that any car that I build, has the no glare mirrors even if it means removing standard mirror and replacing it in the mirror heads. 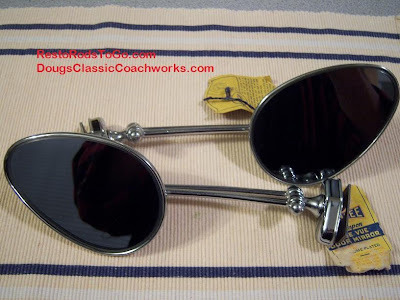 Occasionally you can find, on e-bay, a listing for original and early accessory aftermarket mirrors such a Yankee and sometimes original equipment mirrors as well. I have added pictures of both here. The tear drop mirrors recently sold on e-bay auction for $325. 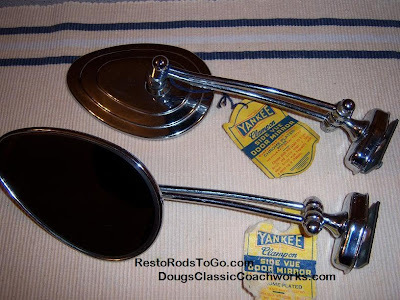 I won an auction for the original 1937 Chevrolet Truck Mirrors for a fraction of that. It was a Buy It Now auction and to my surprise, I missed it the first week it ran. Now that e-bay is much more used than it was in earlier years, it is very rare to find such a deal. I really lucked out. I do have three more original 37 truck mirrors in my stash and would be willing to part with two of them. I will keep at least one for spare, just in case some accident does happen. Finding them is kinda like finding hens teeth. 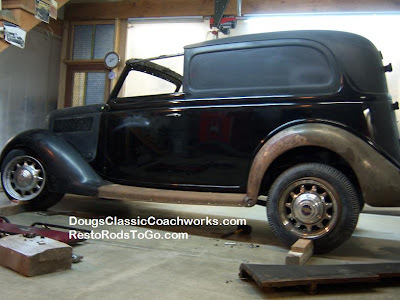 1936 Fords have the most difficult front ends to fit. It is very critical that the radiator is built with great accuracy. The reason for this is that the front end sheet metal is mounted to the radiator. The grill, hood ornament and the hood is mounted to it. 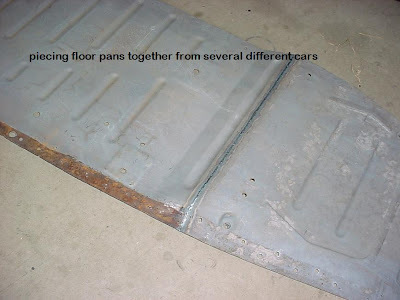 The fit of the entire front sheet metal assembly is determined by the accuracy of the radiator build. 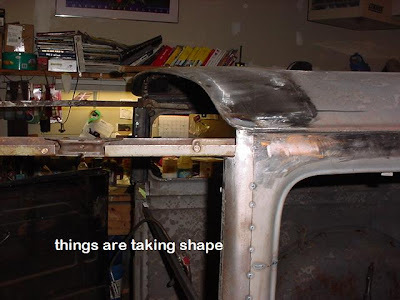 These front ends are usually assembled on the floor and then put on the car as a unit, with the exception of the hood. 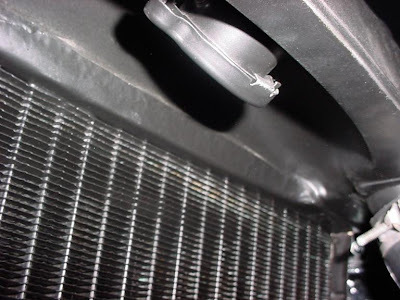 When the radiator is mounted in the front end, it is very difficult to access the bolts that fasten the grill to the horn panels. 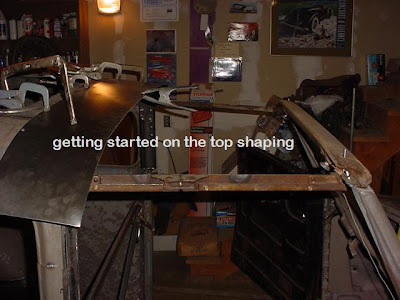 I have solved this problem, and actually made it so the front end can be assembled on the car. I have made a male and female radiator jig set. I made these using an original radiator, in very good condition. Like I mentioned earlier, it is very critical that all the mounting points are accurate. This cannot be accomplished with a tape measure, contrary to what most radiator shops will tell you. I know from much frustrating experience. 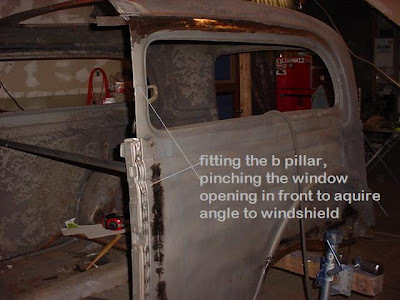 If you have ever built a 1936 Ford, you know exactly what I'm talking about when I say they are difficult. 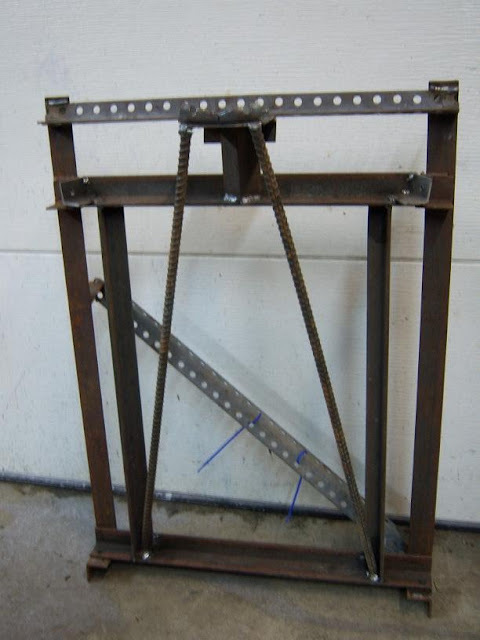 I am considering offering a jig set if there is interest in purchasing one. It will save a huge amount of time and frustration. 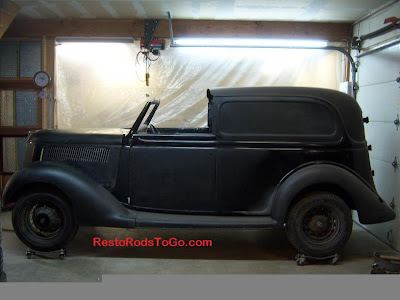 In 1936, there were a few of the standard production cars that were taken to a custom body builder for modification. This happens to be one of those cars. 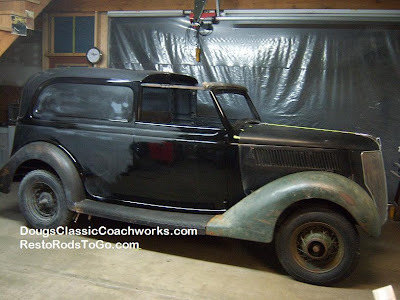 Although the original customization of the car is no longer, it is still as it could have been done in 1936. 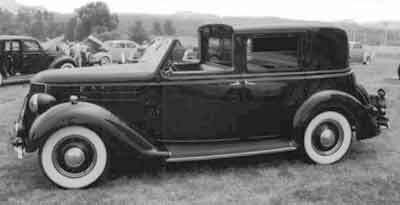 The original custom was a stretched, four door with windows in the sides. The extra doors were constructed of wood and are long gone to the termites or whatever chose to make them a meal. 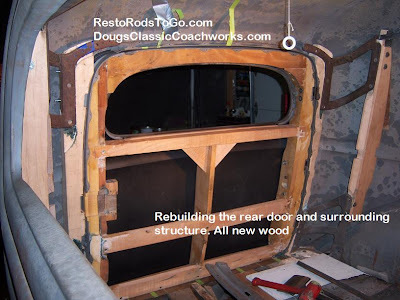 I filled the window holes back shut and cut and pushed the top back to allow for a convertible front portion. 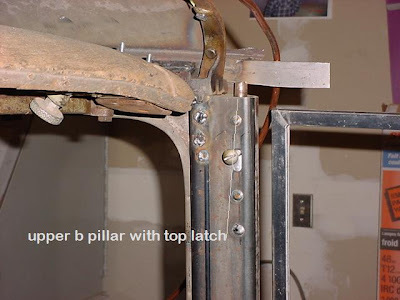 The upper portion of the B pillar is custom fabricated to accommodate the latching mechanism required to hold the convertible top in position when closed. 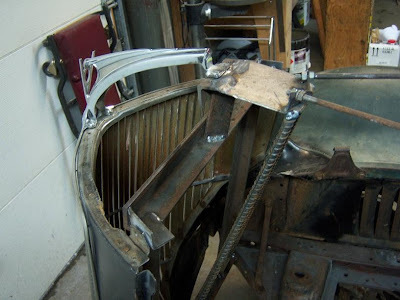 Actually, none of the door opening at the rear part of the front door is original because I had to fit the lower portion of the convertible B pillar. This allows for the convertible doors. The list of special accessories that will be used on this project is long. 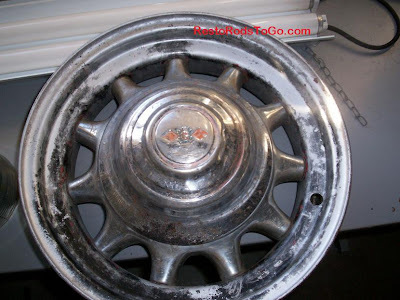 The wheels are known as General Jumbo and were produced by a company called Cleveland Welding in the 1930's. 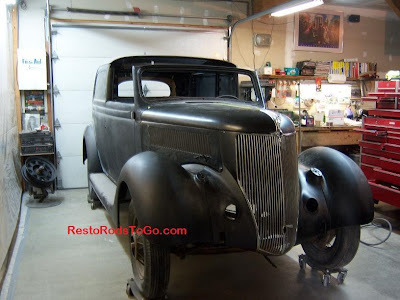 We fit a center section from a Cadillac Limo that was built in 1936. This provides a divider with roll up window behind the driver. I will be adding to this blog post as progress on the project proceeds, so go to the top of your page and bookmark this. Come back and visit again. 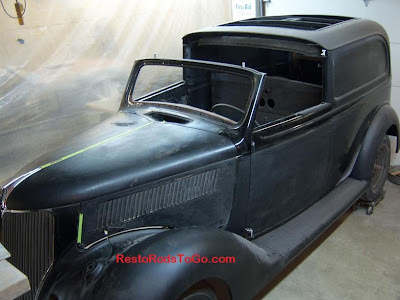 When we started with this car, it was actually the remains of a custom Seibert Coachbuilt sedan delivery that was stretched, shown in the picture above. I added a link to the Seibert web site where I found the picture. Vintage cars often times have inherent restrictions for everyday use, just because they were not designed to go at the speeds of the modern vehicles. Far to often, people want to completely modify the drive train in order to make the vehicle function adequately at modern highway speeds. In doing so, they loose the entire character of the vehicle. I retain as much of the original vehicle that I can, while making it function in a practical manner with today's standards. Using the old stuff is always going to be a compromise when it comes to comparing to modern car function, but then, if modern is what you really want, you should just go out and buy a modern car. It will save you a lot of money and you can start enjoying it immediately. Besides, you won't be destroying another part of fabulous history by purchasing that new car. 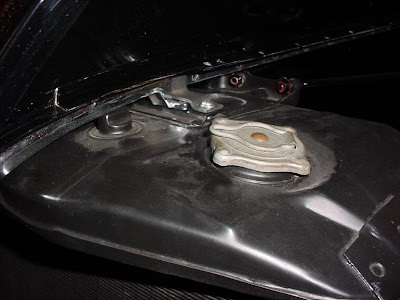 Of course you need to make sure your braking system is adequate for stopping from higher speeds. You don't need disc brakes to accomplish that either. I do prefer hydraulic over mechanical for the reason that the hydraulic braking system is somewhat self adjusting. Mechanical brakes require much more maintenance to keep them in adjustment. You can usually find taller gears for your rear end that will afford higher cruising speeds. 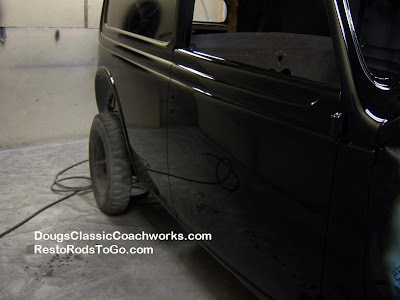 This is by far the cheapest and least intrusive method when it comes to maintaining original character of your vehicle. I have installed a Borg Warner R10 overdrive in the middle of my torque tube/drive line of my 1937 Chevy Truck and added the later 1941 rear end with hypoid 4:11 gears. This is a fabulous addition, as it allows you to split gears, virtually turning my upgrade 1941 three speed transmission to a five speed. 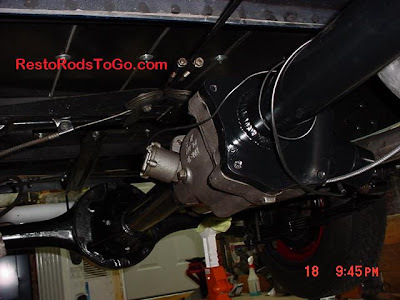 This system requires a bit of machine work, after you locate that Nash or Rambler overdrive but it is the one that is set up for the enclosed drive line so you can bolt to both ends. I have 35,000 miles on mine now and have fully tested it in continuous 100 degree temperatures during my solo cross country drive. 70 mph was the comfortable speed and that is what I maintained in the hottest part of my trip. If you would like more information on this conversion, please feel free to contact me. I can do more explanation on how to set up the controls etc. See the pictures below. Balloon Tires were introduced in the early thirties. 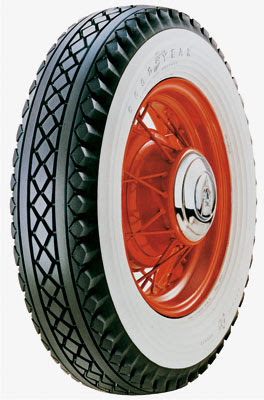 All the major tire manufacturers offered their version of the tires. General Tire Co. called them Jumbos... "General Jumbo" is the most well known version of the "Balloon Tires"
Firestone and Goodyear use model names "Air Wheel" and "Air Balloon". The wheel that General Tire Company used was produced by Cleveland Welding and the wheel was stamped with the identifying mark, Cleve Weld. Kelsey Hayes, Clark Equipment, and a number of other companies manufactured wheels for other tire companies. They were offered as a package, wheel/tire combination from the tire companies. Looking at third picture of the 11 spoke wheel you will see the Goodrich logo on the cap. 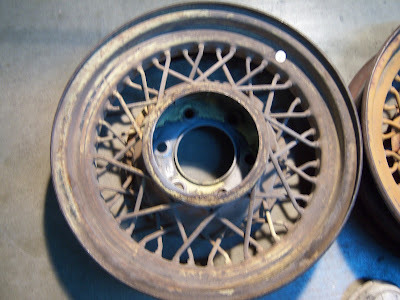 Chevrolet offered 40 spoke, or bent spoke 16X4-1/2 inch wheels for 1932 and 1933. 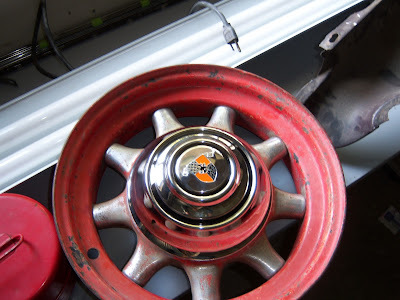 They have the official "Bow Tie" stamped into the wheel, identifying them as an official accessory wheel. 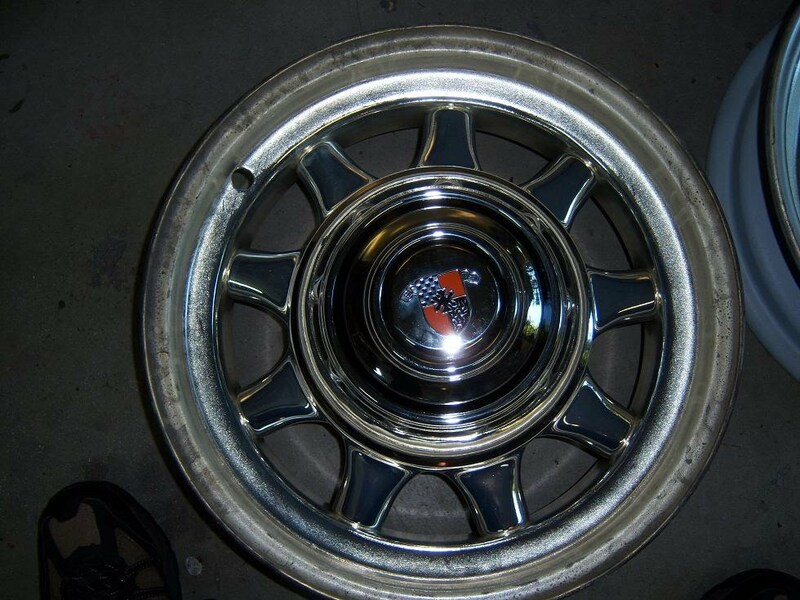 These wheels are extremely rare, as are the other special aftermarket wheels. The larger profile tires gave a better ride and allowed for travel over softer terrain. Now that the Cosmichrome is done, I will paint the rim black, just like it was when it was new. 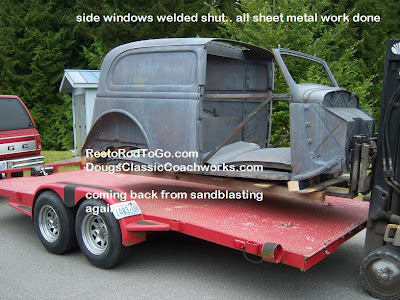 This will give a totally different look to my 37 Chevy Pickup! These are the tires, without the whitewall though. 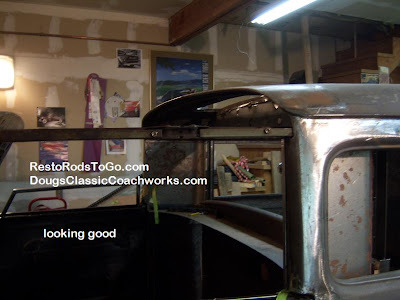 This 1936 Ford Radiator shown here in the pictures, displays how I retained the original look, while increasing the cooling ability by pressurizing the water. In doing so, the temperature of the boiling point is raised. I used the original cap on top, and blocked off the original overflow tube. I then added a later, pressure type 90 degree neck inside the fan well on the underside of the top tank. I extended the neck all the way to within 1/8th of an inch of touching the inside of the top of the tank. By doing so, I utilized the full capacity of the tank. I then ran the overflow off the pressure neck. This conversion works only when you are running a different engine application. In this particular case, I used a 1957 Corvette FI engine. 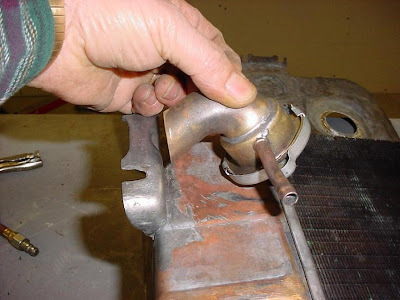 Pressurizing the 1936 Ford Radiator must be done with caution. Because the hood is hinged off the radiator, it is critical that the large top tank is not expanded by too much pressure. The maximum safe pressure is about 4 lbs. It was a complete success. The cooling system works great. You have to get down pretty low to see the pressure cap. This picture shows how the pressure cap will set inside the fan well and reach the top of the tank inside. Which is very important to take advantage of the full capacity of the top tank. The original cap on top. After the pressure cap is installed in the fan well on the underside of the top tank. In 1929, Ford Motor Company built a Concept Car, snow tractor that was a very unique design. It traveled through the deep snow very well. It makes you wonder why it didn't catch on. Watch a 1935 Chevrolet car race an ice boat! You may be surprised who comes out ahead in this race, and you'll get a good laugh along the way.